A recent PBS Newshour report by Paul Solman on Thursday 3/15/12 in his series “Making Sense of Financial News” gave pause concerning the role of high frequency traders (HFT) on Wall St. (and doubtless on other markets around the world). First, you might ask what are HFTs? These are traders who use computer-based algorithms to select, buy, and sell shares on the markets. The speed of these transactions and the “thinking” that is performed is driving the HFTs to locate in lower Manhattan as close as possible to the main Internet port in the city. The few microseconds saved by not being a half mile away on Wall St. turns out to have great significance to HFTs. The existence of HFTs first came to public notice when the great “flash crash” took place. On May 6, 2010 at 2:42 pm the Dow Jones industrial average, already down by 300 points that day, suddently lost more than 600 poijts in 5 minutes. 20 minutes later the market had regained the 600 point loss. Investigations pointed to the role of HFTs in these events. Since then there has been a lot of discussion of the stability of financial markets and the potential role of HFTs. The Solman report noted that HFTs represent 2% of all the firms trading on Wall St., but conduct over 75% of the transactions. So, when you here that volume of the Big Board today was 3.56 billion shares (3/26/12) 2.67 billion were traded by HFTS. Solman also noted that the average time a share is held is 22 seconds. What seems strange is that the question of the function and utility of HFTs is never examined beyond economists trotting out the well worn explanation that they are providing liquidiity to the market. By liquidity they mean the presence of buyers and sellers in the marketplace when someone wants to make a transaction. But is this a serious claim in favor of HFTs? Does this incredible display of computing power really mean anything more than people gambling on a fractional move within a few seconds? To turn back to HFTs, why do we need this kind of transaction? How do they contribute to economic growth? These activities are by definition a zero sum game. They are like every other form of gambling a zero sum game. There are winners and losers, but no incremental gain for the economy. Other than enriching the HFTs at cost to others with smaller computers and fewer PhDs on staff what do we get for allowing these activities? Potentially catastrophic destabilization of financial markets? Where is the upside for society as a whole? Isn’t a primary purpose of any economy to increase the size of the pie, not just to redistribute existing wealth? Big Money, Big Politics…the best government bought, not by you…..
Do We Need Wall St. and all the other gamblers in the financial services world? 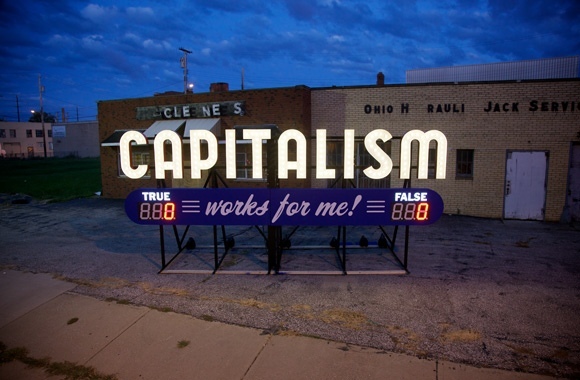 What Is Capitalism and Why Do We Need to Understand It?